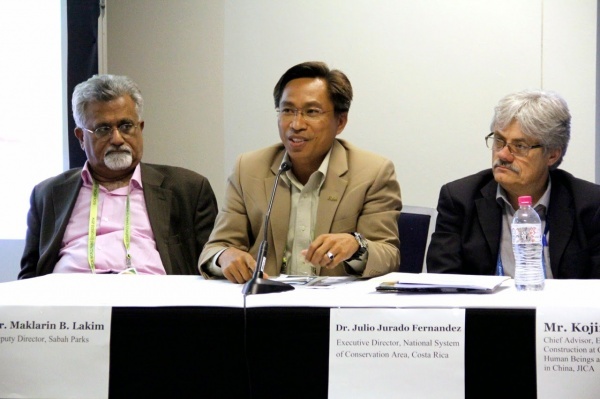 The Japan International Cooperation Agency (JICA) and the United Nations University Institute for the Advanced Study of Sustainability (UNU-IAS) co-organized a side event on 14 November 2014 during the IUCN World Parks Congress 2014 in Sydney, Australia. The title of the event was “The Satoyama Concept: Theory and Practice”, and it served to introduce the concept of the Satoyama Initiative and provide example cases of JICA projects highlighting issues and challenges faced by practitioners in production landscapes and seascapes around the world to an audience of people working on protected areas in various capacities. The event began with comments by Mr. Koji Mitomori from JICA, who spoke on the Satoyama Initiative’s relevance to Aichi Biodiversity Target 15 in terms of ecosystem resilience. Mr. Mitomori also gave a brief overview of JICA’s strategy for nature conservation and Japan’s bilateral cooperation in ODA, and mentioned that its training course on satoyama issues in Japan has just finished its fourth year of operation. Next, Dr. Kaoru Ichikawa of UNU-IAS presented an introduction to the Satoyama Initiative and the International Partnership for the Satoyama Initiative (IPSI), in particular their relevance to protected areas, whether production landscapes and seascapes are found inside protected areas or outside serving as buffer zones or corridors. She stressed the important interaction between people living in production landscapes and seascapes, and the areas under various types of formal or informal protection that provide ecosystem services that these people rely on. Dr. Julio Jurado Fernandez, Executive Director of the National System of Conservation Areas in Costa Rica, spoke next, on “Participatory Protected Area Management in Barra del Colorado Wildlife Refuge, Costa Rica: A protected area with people”. Since 2008, JICA has cooperated with the Barra del Colorado Wildlife Refuge for participatory management inclusive of the local communities living in it. Lessons learned so far, including the need for landscape-level management and inter-institutional efforts, have been fed into a new five-year project for participatory biodiversity conservation with environmental education and market development for eco-friendly agricultural products. A presentation followed by Dr. Maklarin B. Lakim, Deputy Director of Sabah Parks in Malaysia, about the “Crocker Range Park: Community Use Zone (CUZ)”. The Crocker Range Park is similar in size and latitude to the case from Costa Rica, and serves to highlight a different approach to some similar issues. The Park Enactment creating the park in 1984 stipulated that no human activities were allowed inside the park, although there were already communities living inside the park boundary and relying on its resources. After years of problems with encroachment and unsustainable land use around the park, Sabah Parks formed “Community Use Zones” at the edges of the park, where communities could engage in sustainable cultivation and collection activities. Implementation has shown that the communities in control of their own resources have been the best stewards of the park’s ecosystem services on which they rely. A final example was provided by JICA’s Mr. Kojiro Mori, Chief Advisor in charge of Environment Construction at Co-existent Areas of Human Beings and the Crested Ibis project to China. Mr. Mori spoke on a “Win/Win approach toward co-existence of people and the endangered Crested Ibis”, a flagship bird species living in a few scattered rural areas of China. These areas have seen rapid development and the destruction of valuable habitat, but local people in Ningshan County have cooperated in restoring an irrigation system for rice paddies that provide not only food production but also a favorable habitat for the ibis. This is an excellent example of a “socio-ecological production landscape or seascape (SEPLS)” as highlighted by the Satoyama Initiative, where sustainable production activities have benefits for both natural biodiversity and human well-being, and has been expanded to production activities involving pesticide-free cultivation of pears as well. These examples were followed by a panel discussion facilitated by Dr. Motohiro Hasegawa, a Senior Advisor at JICA, and including the four presenters joined by Dr. Natarajan Ishwaran, a State Recuited Expert at the International Centre on Space Technologies for Natural and Cultural Heritage (HIST) under the auspices of UNESCO in the Institute of Remote Sensing and Digital Earth (RADI) in Beijing, China. Dr. Hasegawa opened the discussion with comments on how the examples presented showed the importance of integrated protected area management and how the Satoyama Initiative provides a variety of means for implementation. 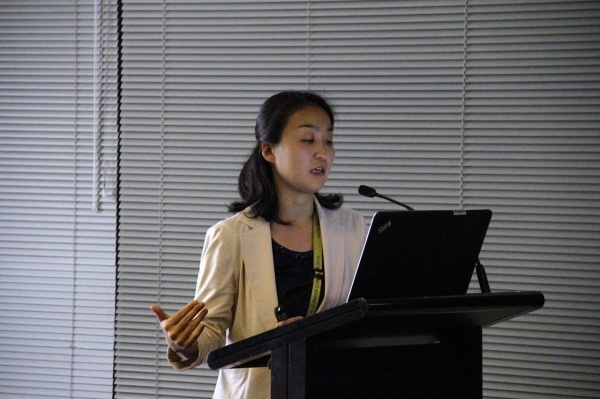 Dr. Ichikawa again stressed the need for a participatory approach with all stakeholders involved, and touched on how such an approach including protected areas can create a “new commons”, with collective management of common resources by all stakeholders. Dr. Ishwaran pointed out that the examples demonstrate how complex, multi-dimensional strategies are coming to replace simplistic models in many places, and often can result in better conservation outcomes, and also how flagship species can help to raise public awareness. In the following question-and-answer session, audience members raised points related to the role of traditional and local knowledge, a major component of the Satoyama Initiative in tailoring management strategies to the local context. On the other hand, it was also pointed out by an audience member that traditional landscapes and seascapes are disappearing as more people want to live in cities. In response, Dr. Ichikawa explained that the idea is not to return to old ways, but to create sustainable management strategies that make the most of traditional practices and innovative solutions. Related cases were also raised by audience members and panelists alike, including conservation of dolphins in Hawaii and the creation of honorary park rangers in local communities. The discussion was still lively when the allotted time for the event ran out, with many present fully engaged in the issues, challenges and opportunities raised. Dr. Hasegawa’s proposal that “the Satoyama Initiative can be one inspiring solution”, in line with the World Parks Congress’ theme of “People, Parks, Planet: Inspiring Solutions”, was enthusiastically approved by the participants.